Can You Survive? 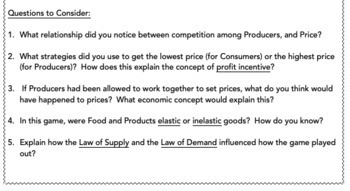 Free Market Economic Simulation Activity! Make Economics FUN! 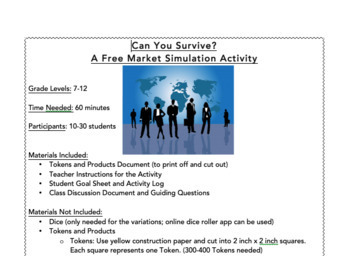 · A FUN and ENGAGING activity to show students how supply and demand allow a free market system to work! Demonstrates concepts such as scarcity, law of supply and law of demand, and the idea of profit incentive. · Students will be assigned a role as either a Producer or Consumer. The primary goal for all students is survival—being able to purchase food and paying for the cost of living each round. The secondary goal is to accumulate the most wealth measured in the number of tokens saved by the end of the game. · This activity can be used as an introductory activity or as an application of previous learning. This activity is a great way to get students involved in their learning in a way that is FUN and ENGAGING for all students!